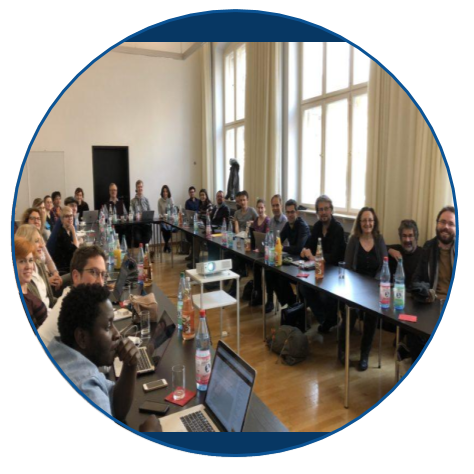 Read about the masterclass that contributed to both CLARIN's and DARIAH’s strategic commitment to training and education as an essential component of infrastructure building. Piotr Banski from the Institut für Deutsche Sprache (Germany), who presented the CLARIN infrastructure for lexical data. Furthermore, two keynote speakers were invited to contribute to the masterclass: Frieda Steurs from KU Leven and James Pustejovsky from Brandeis University. This masterclass, i.e. a series of training and working sessions where most of the knowledge transfer is issued through the concrete work on the participants’ projects. We want to reflect here on what everyone has obviously considered as a very successful meeting by providing an overview on the instructional sessions and the actual projects that been brought by the participants as reflected in the final symposium that took place on 8th December. Which reuse conditions bear upon the various dictionaries, how to ensure a wide dissemination of the results, comprising the encoded source? Which license should be attached to such resources, how to ensure a fluid dissemination when the recommended creative commons CC-BY license is not applicable? How to go towards a network of available lexica in the context of stable hosting capacities offered by European infrastructures such as DARIAH and CLARIN? How to build up infrastructures that also allow the correction, improvement or enrichment of existing resources? How to deploy a reference subset of the TEI guidelines (TEI Lex) that would serve as a target deployment format readily usable by a variety of tools (presentation, query, hosting/LTA)? At the end of the week, during the final symposium that took place on 8th December, it was clear for all participants that the format of a masterclass was particularly appropriate for lexical projects. Comparing practices and improving one’s own technical skills contributes strongly to the quality of the event. The masterclass contributed to both CLARIN and DARIAH’s strategic commitment to training and education as an essential component of infrastructure building. The discussions of various data formats, standards and general data management practices in the lexical domain helped attendees expand their horizons and adopt new skills. In addition to the impact on individual researchers who attended the masterclass, all the training materials were made available in the DARIAH WG “Lexical Resources” GitHub repository: https://github.com/DARIAH-ERIC/lexicalresources/tree/master/Events/LexMC2017. Considering that the DARIAH Working Group “Lexical Resources” plans to hold further lexical data masterclasses, a fruitful cooperation between CLARIN and DARIAH in this field may continue in the future as well. A more detailed account of all the participants and their projects can be found at https://digilex.hypotheses.org/386. Blog post by Toma Tasovac and Laurent Romary.